Last month, Facebook launched a major overhaul in the privacy settings. The changes, more than a dozen in all, were in two key areas: privacy changes to user profiles and changes to how users share content. Now with the changes to the timeline, actions, and open graph announced on Thursday, I’ve been hearing a lot of concerns, fears, and reports from nonprofit folks that their audiences are upset. The news ticker on the upper right that is streaming all your friends updates in real time. While I found it annoying and looked for a way to turn it off, I’m hearing from that their networks are confusing – thinking that those updates are public – and asking their friends to “unsubscribe” them. Scoble observed this pattern and offered some advice on how to reduce the clutter. Dear friends, if you don’t want your comments appearing in my ticker, please unfriend me. Don’t friend people who you don’t want to see your comments in the ticker on the right! This ensures the best experience for everyone. All this copying of status updates asking people to unsubscribe from comments is silly. 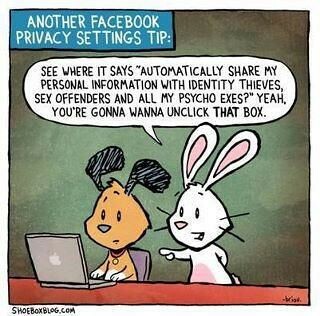 I have been doing mini-trainings on privacy for those are concerned about privacy, but not technologically savvy. These have been a walk through the privacy settings of different social networks, particularly Facebook so that people understand the degrees of choices – from totally opened to totally closed online (the latter isn’t really totally possible online). 2.) Understand your privacy settings and make choices about what you want to share – and it isn’t going to black and white, probably shades of grade based on your relationships with people – and the type of content you are sharing. We haven’t had to think about this in the past. If you are worried about what is being shared on the news ticker, here are some step-by-steps from Mari Smith to get better control of that. Also read this post. 3.) Think about the information you are sharing online and who might be reading it – but not from a place of fear or “something bad will happen.” Also think about opportunities and benefits. What are your thoughts about the tension between privacy and publicness? What is your personal approach to sharing information on social networks? What are people thinking or saying in your organization? Update: Some more thoughts about privacy and Facebook from Mari Smith, including a link to a this post: Why Timeline Changes Everything. I often wonder if Facebook developers still believe everyone uses FB just to keep up with their closest friends and relatives. So many people today use it for professional connections, too. On the one hand, it would seem smartest for FB to recognize their users’ real behaviors and accommodate them. On the other hand, when you make the choice to blur the line between friends/relatives and acquaintances/unknown professionals by using this particular platform, you are choosing to share (and to receive) personal information. We’d love to have you come on by and participate in our weekly privacy chat on twitter called #PrivChat. Every Tuesday at Noon ET ! So overlooked are the opportunities – to share art, passions, and value. It’s all too easy to slide into meaningless jabber. Ironic to me the folks most concerned about their privacy share the most information and the least amount of value. Cheers for another solid post. Love how calm a voice you come across with.